Azure Storage metrics in Azure Monitor, which was previously in public preview, is now generally available. Azure Monitor is the platform service that provides a single source of monitoring data for Azure resources. With Azure Monitor, you can visualize, query, route, archive, and take action on the metrics and logs coming from resources in Azure. You can work with the data using the Monitor portal blade, the Azure Monitor Software Development Kits (SDKs), and through several other methods. Azure Storage is one of the fundamental services in Azure, and now you can chart and query storage metrics alongside other metrics in one consolidated view. 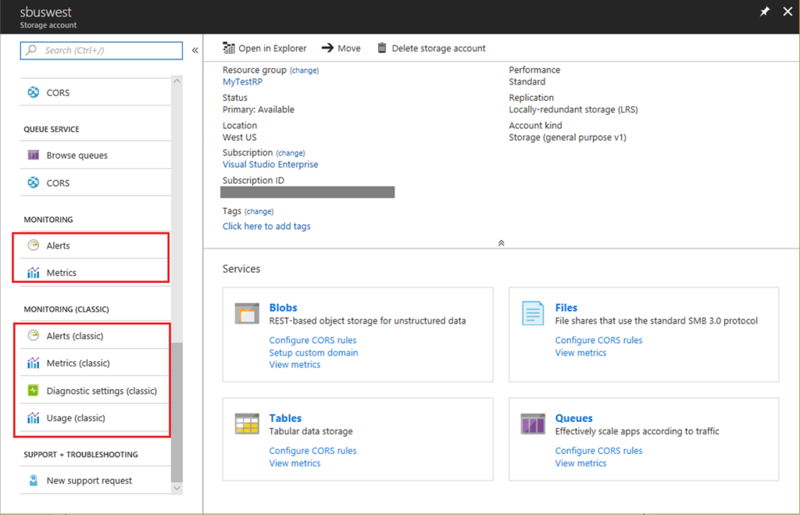 For more information on how Azure Storage metrics are defined, you can see the documentation. Meanwhile, the previous metrics become classic and are still supported. The following screenshot shows what the transition experience is. The Alerts and Metrics work on new metrics, and Alerts (classic), Metrics (classic), Diagnostic settings (classic) and Usage (classic) work on classic metrics. The support of classic metrics will be ended in the future with early notice. It's highly recommended to migrate your workloads or monitoring to adopt new metrics, based on migration guideline.